Lately as I try to get back into the swing of things, an as the home projects slow down some, and I feel a sense of calm in our lives, I've started doodling again more... I have been sketching anything that comes to mind, but overall I have always gravitated towards drawing female figures. Something about the shape of their eyes, the styles of hair I can only imagine, or even a slight personality I may give to them in the gesture of their smirk has always been something I’ve enjoyed. Head dresses, hats, crowns, glasses and more are also fun to play around with an this viking was no different. I also dabbled in my kiddos colored pencils some. I’m not huge into incorporating color, I can but I don’t because I love the way clean black line work looks, but this piece was pleasant change from the norm. What are you doodling lately? 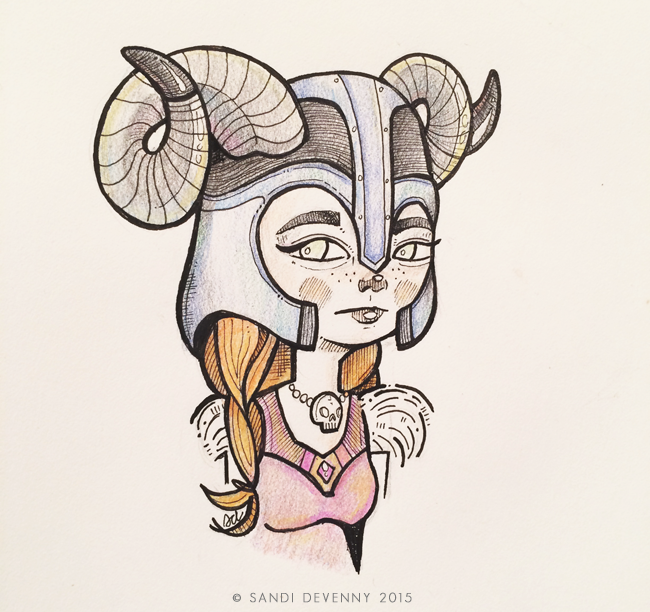 If you care to see more of my doodles you may on the portfolio page >> here. Enjoy! Happy Thursday!